Our customers have asked for more selection, so we are unleashing our first line of original MJV designed wedding bands! We have been having so much fun working on this project with our jeweler. 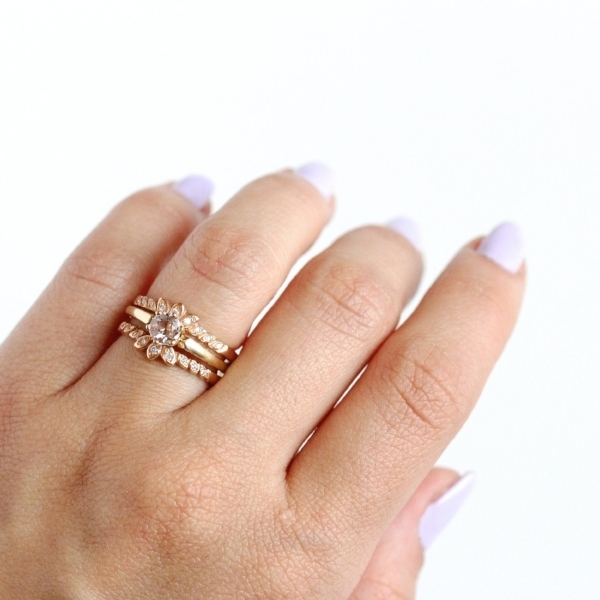 Made with recycled gold and ethically sourced stones, our 6 original designs are sure to appeal to the vintage loving lady that wants to add a modern handcrafted twist to her ring stack. Our bands, designed by the owners of Maejean Vintage and inspired by vintage aspects we love, are perfect worn with a vintage engagement ring, worn alone, or are great for stacking! Each band is carefully handcrafted right here in PA by our trusted jeweler. All the original designs are lovingly named after our inspiring female ancestors: Rebecca, Lucinda, Luella, Cora, & Jane. Completely handcrafted by our jeweler, right here in PA! The Rebecca Band, handcrafted in 14k white or yellow gold, is studded with six round brilliant cut genuine diamonds and detailed with milgrain edging. This vintage-inspired ring is dainty, romantic, and timeless. The Lucinda band features a gentle arch, perfect for snuggling right next to your engagement ring. The band is handcrafted in 14k yellow or white gold, and embellished with five genuine sapphires, all securely bead set. This band would look nice worn with a classic solitaire, or a ring with complimentary sapphire accents. The Luella band is simple, classic, and oh-so-stackable! The polished band is finished off with hand embellished milgrain. This timeless band is easy to wear in a diverse amount of ways. It pairs nicely with a large range of engagement rings and is also a fun stacking band. The Cora band is a chevron beauty, handcrafted in 14k yellow or white gold. This unique band contains a sparkling genuine diamond, bezel set at the tip of the V.
The Cora band would pair nicely with a simple solitaire engagement ring. It's also an amazing stacker, which instantly steps up the game of your ring stack. The Jane band, named after our great-grandmother who was an artist, contains sweet nature-inspired leaf motifs, studded with diamond accents. The band, which is made in 14k yellow or white gold, contains a slight curve, and could easily be worn alone or paired with an engagement ring. The band would look lovely nestled up to a wide range of engagement rings, and would be perfect for the nature-loving lady. The Jane jacket is the perfect piece to enhance your engagement ring! The jacket will truly transform the look of your ring, giving it extra diamond sparkle, and adding more of a statement flair. The jacket contains a total of 18 diamonds, and is detailed with leaf motifs and milgrain. A stunning and very unique piece! Which one of the Maejean Vintage hand-crafted wedding bands is your favorite? Newer PostWomen's History Month - Female owned businesses we love! Older PostFeatured Shop on Etsy!